A tattoo artist from Essex is the subject of a 9ft by 7ft portrait being unveiled at the National Portrait Gallery today. Zoe Windle, 35, was painted in her bra by celebrated realist artist Jason Brooks, whose paintings are so lifelike that they resemble photographs. Her image will hang alongside two more large Brooks works - a portrait of Nobel prize-winning scientist Sir Paul Nurse, commissioned by the gallery, and another of Formula 1 driver Jenson Button. Ms Wendle, who works in a tattoo parlour in Southend, said: "It's so exciting to have a picture of yourself hanging in the National Portrait Gallery - but it's probably more exciting for Jason. "I think it's a fantastic portrait and it's quite scary to see myself in such a stark light - you can see all the imperfections. You can even see where the ink on my tattoos has faded. "My only concern is that I think it makes me look older. I was in my late twenties when it was painted but I look older than that." She was not concerned about thousandsof people seeing her in a bra, saying: "They won't know who I am. Even if I was standing next to it they probably wouldn't recognise me because my hair's a different colour." 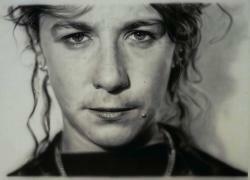 Brooks met his muse at a tattoo parlour in Clerkenwell, where Ms Wendle worked a receptionist. She said: "He was having a tattoo done and I used to book him in for appointments and bring him cups of tea. He asked me if he could paint my portrait and I thought, 'Cool.'" All three portraits relate to the artist's fascination with mortality: Sir Paul specialises in cancer research, Jenson Button is engaged in a dangerous sport and Ms Wendle endures pain to decorate her body. Brooks said: "What's really important to me is having that pornographic gaze, that forensic detail. The flaws, the marks - they're the things that I fall in love with." 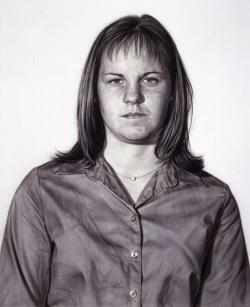 He uses his own photographs as the source for his paintings but he does not regard himself as a photorealist. "My work is ephemeral and that relates to photography, the funereal aspect of photography, capturing that frozen moment," he said. He applies paint using an airbrush to create every detail. From a distance the images are sharply defined, but close-up they are made up of abstract forms.